Eurocom launches World's First Notebook with HDMI 1.4 Input Port! port in the new Panther 2.0 Mobile Workstation. processors the Panther 2.0 has serious computing power. XTU (eXtreme Tuning Utility) and XMP (eXtreme Memory Profile) functions. 1.4 input port, making the Panther 2.0 the first to have this feature. video, audio and data in a single cable. stays in sync with the video. transfer video just like any other video device. standards and ensures a long lifespan of the notebook. filmed and uploaded to the Panther 2.0 for editing all while off site. that can be used for PC gaming and console gaming. Panther 2.0 for high definition video viewing. or output high resolution video. that inspire and enable individuals to reach great possibilities. 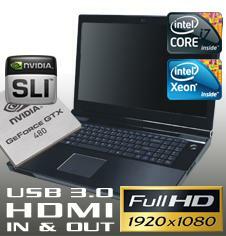 information on Eurocom or to customize a machine, visit www.eurocom.com. respectively in the United States and/or other jurisdictions.